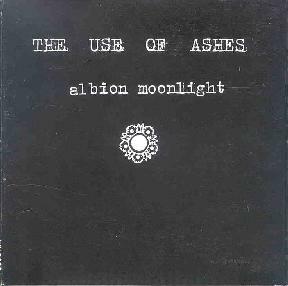 The Use Of Ashes - "Albion Moonlight"
This was released back in 1999 so we were a little late to receive it. The band are from Holland and are a psychedelic acoustic-electric folk duo consisting of Maarten and Peter. The music is a mixture of styles, some reminds me of Pink Floyd, some of Reefus Moons, some of the Holy River Family Band. "Flowerman" reminds me of U2! The lack of real drums is a slight drawback for the band but there are some really excellent pieces of music like "Hinterland". "Under the Icemoon" is quite a cool song but when the techno drums come up it disturbs the sound a bit. Quite a mixture of material on this CD and people will find some good music here within. What are the band up to now? For more information you can visit The Use Of Ashes web site at: http://www.crazy-diamond.nl/ashes.htm. Albion Moonlight is distributed by The Wild Places. You can email them at: ACEofDISCS@aol.com.